Whether your garage door needs small or large repairs, we are the ones to call. 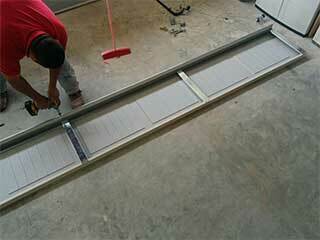 We will use the highest quality parts and our years of expertise to get your door up and running in no time. Our prompt and professional service is always available to the residents of Sugar Land, regardless of the size of the job. We know how stressful it is to try to leave the house one day and notice that your garage door opener isn’t working anymore. This is why we offer urgent repairs for all types of remotes, including universal openers and openers from all kinds of manufacturers such as Stanley, Chamberlain, Liftmaster and more. Our team of seasoned technicians offers same day or next day repair services for all types of springs, no matter what model and make of door you have. We know that a malfunctioning garage door is scary and frustrating. We will diagnose the problem and take care of the problem quickly and safely. If you have a problem with a glass garage door, it doesn't necessarily mean that you are required to replace it altogether. When we come out, we can do a survey of your door, and then provide you with all the advice you need regarding the work that may be necessary to make the door work just like new. Most times, replacing broken parts does the trick. Call Garage Door Repair Sugar Land today to benefit from the best service in town!